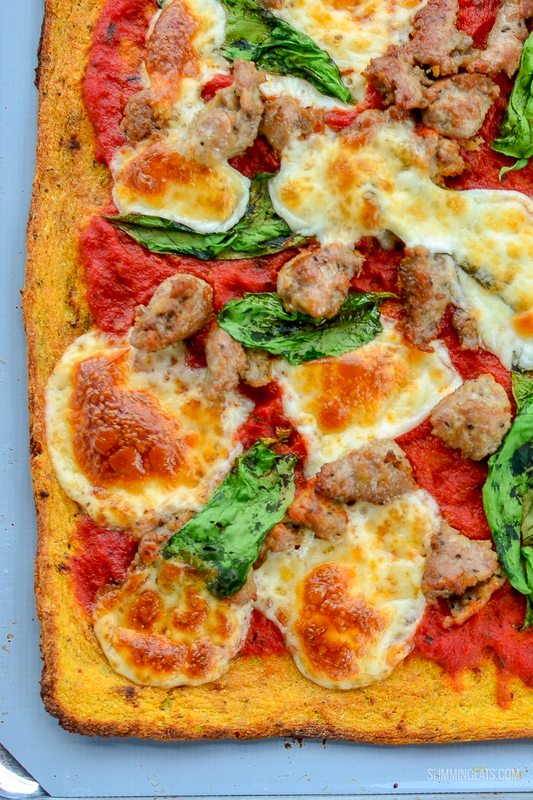 The best cauliflower pizza for those fakeaway nights without the guilt. The whole family will dig in and enjoy this one. 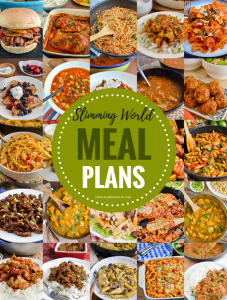 Cauliflower is such a versatile vegetable that can be used in a variety of different ways to create various replacements for higher carb food items. I have tried a couple of different cauliflower pizza recipes, but as most use cheese in the base, that doesn’t give you much cheese leftover for your topping, especially if you are trying to keep your syns low for other parts of your day. 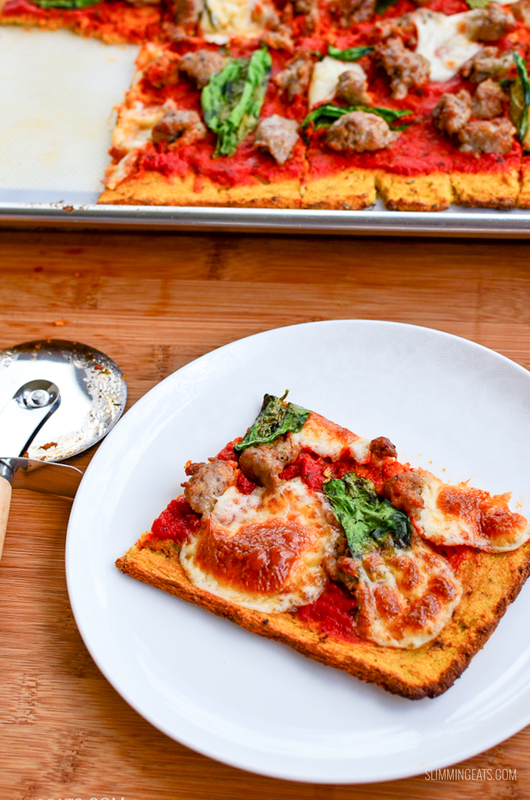 This works really well, obviously, it isn’t super crispy, like you would expect with a proper pizza dough, but it holds together well and is super yummy once you add all your toppings. Firstly we can’t have a pizza without an amazing Pizza Sauce – delicious, homemade and the best pizza sauce you will try. 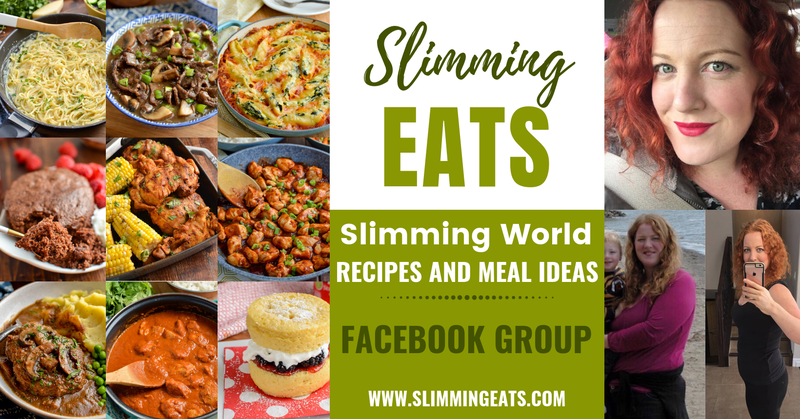 Cauliflower is also a speed food on Slimming World, so just think of all those speed foods you are getting into your meal too. 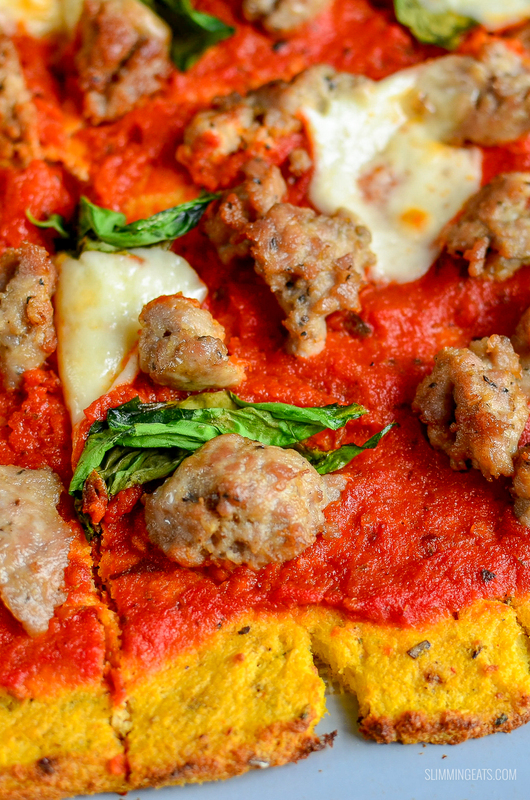 For toppings, you can go with my suggestion of crumbled up homemade Pork Sausage Patties, spinach, mozzarella, the yummy pizza sauce or add your own choice of toppings. Make a Hawaiian, Margherita, veggie or even barbecue chicken pizza. The variations are endless. 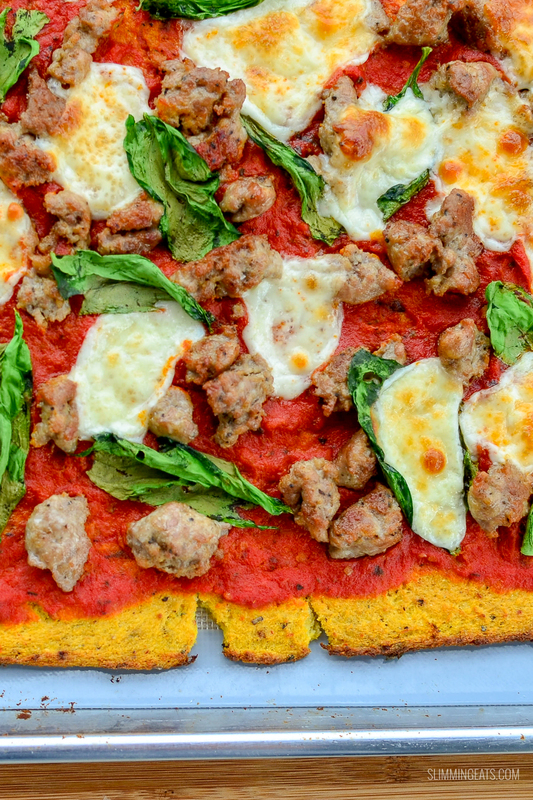 Best of all this pizza is totally gluten-free, so great if you can’t eat gluten due an intolerance or allergy. It is also great for those who can’t eat dairy if you skip the cheese on top. On thing I do recommend is to make sure you line you baking tray with either parchment paper or a silicone baking mat, to ensure the base doesn’t stick, this makes it super easy to flip over. salt and black pepper to season. Break cauliflower up into florets. Gradually adding to a blender, and pulsing until it is all finely chopped. Then put it on the blend cycle and blend until it resembles a really fine mix, kind of like a dough. Tip out onto some cheesecloth or a clean tea towel and squeeze thoroughly to remove all moisture. Add back to the blender with the 3 eggs, and blend to combine. 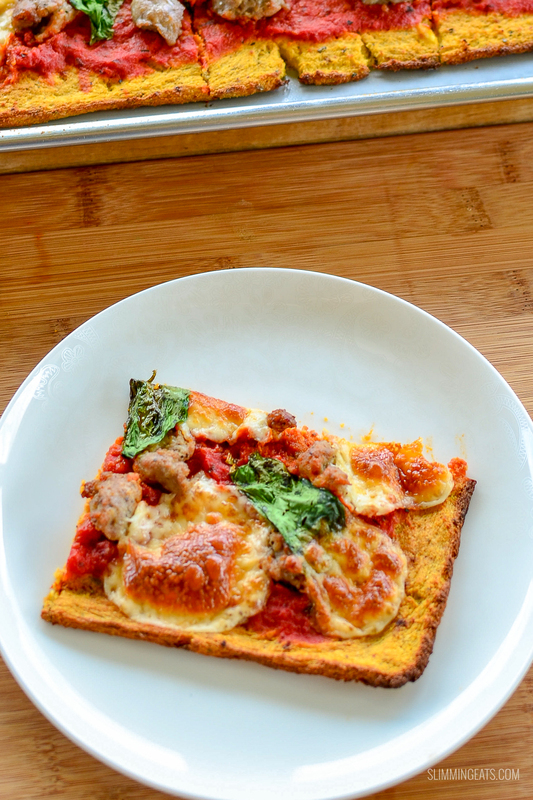 Remove from oven and spread with pizza sauce, topped with your choice of toppings and the mozzarella. Place in the oven and bake until cheese is golden and melted. DO you ever have trouble getting it off the parchment paper? Did with mine! Squeezed out the moisture first. Nope never have problem with it sticking. Absolutely nothing should stick to parchment. So you may want to try using a different parchment paper.